Americans have had a busy year bidding farewell to iconic public figures. We’ve just bid adieu to our nation’s 41st president, George H.W. Bush, who in just a few days will be laid to rest next to his beloved wife, Barbara, and their first-born child, who died at age 3. We have given President Bush the kind of sendoff he deserves, but which reportedly he would have disliked intensely. His son, Neil, noted that “Dad” would be embarrassed by “all the nice things people have said about him.” Nice things? Good, gracious. Those “nice things” do not even begin to do justice to the service Bush 41 gave to the nation he cherished. It has been well-chronicled certainly since his death this past Friday at age 94. It was well-known already. I have declared my belief on numerous occasions that Bush 41 was arguably the most qualified man ever to hold the office of president. As I have listened to the tributes, that belief has been shored up. As for his wife, “Bar,” she left us in the spring. She and George H.W. Bush shared a 73-year marriage that produced six children. Five of them grew to adulthood, with their first child, Robin, dying as a toddler of leukemia. Barbara Bush didn’t aspire to pursue a career other than being a homemaker and devoted spouse to a great man. She, however, achieved greatness, too, as first lady. She promoted literacy and always, without fail, carried herself with dignity and grace. The tributes paid to the former first lady served as well to remind us that love truly does conquer all. As for the third icon, he ventured to the gates of hell and returned to build a political life devoted to serving his nation. John McCain died in August of brain cancer. 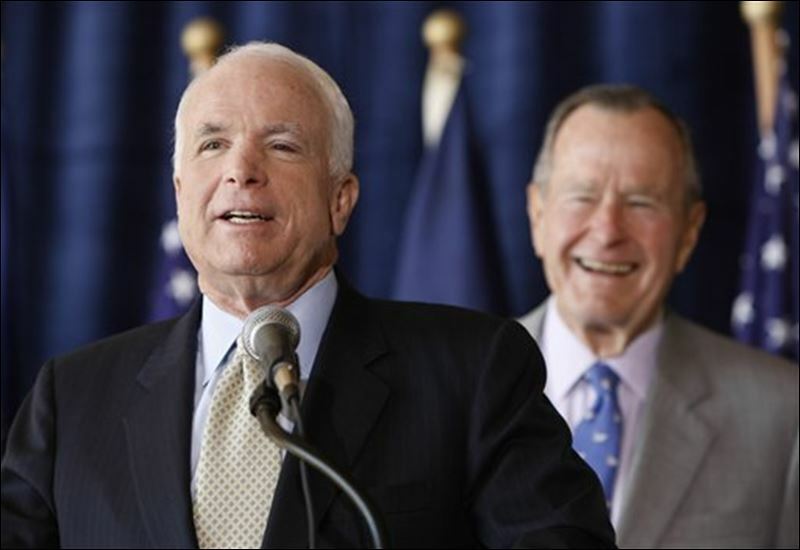 He served for three decades as a U.S. senator from Arizona. And, yes, he was a bona fide, true-blue war hero. He was shot down over Hanoi during the Vietnam War, taken captive and held as a POW for more than five years. Donald J. Trump sought to disparage McCain’s war service by denigrating his hero status, how he was a “hero only because he was captured. I like people who aren’t captured.” That despicable utterance stands as a testament to the complete absence of character from the man who uttered it. McCain would serve in the House and then the Senate with distinction. He rose to the level of icon during his years in Congress. His years as a POW elevated his profile immediately upon being elected to Congress. He ran twice for president, losing the Republican nomination in 2000 to Texas Gov. George W. Bush and then losing the 2008 election to Sen. Barack H. Obama. All three of these individuals sought in their ways to achieve a “more perfect Union.” They are worthy of every single ounce of tribute they have received.